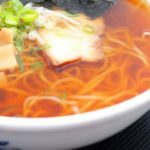 Many people know about Kumamoto Ramen. The famous style of Kumamoto is a pork-based broth that is famous alongside Hakata and Kurume Ramen. 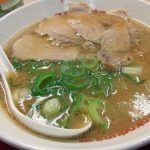 The main characteristics of this ramen are the pork-based broth that is relatively light with medium size noodles. 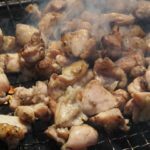 The toppings that come only with it are Kikurage, a type of mushroom, green onion, and chashu (pork). 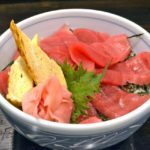 However, this classical style of Kumamoto is not the only variety available to enjoy here in Kumamoto. 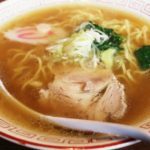 Here we will introduce popular ramen shops in Kumamoto. This shop is located near the Kumamoto Asahi Broadcasting Main Facilities that are across the Tsuboi River from the JR Kumamoto Station. The black or white curtains above the entrance mark this shop. In the airport you can purchase the Koku-tei ramen for home use as a souvenir as well. In this way Kokutei Ramen is well-known and extremely popular. It is one of the ramen shops that represents Kumamoto Ramen. There is not too much fat in the home-made soup that includes garlic. 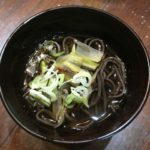 The noodles used to accompany this soup are the medium-small noodles that are made specially by Koku-teihome-made noodles. We can highly recommend the ramen with egg in it. 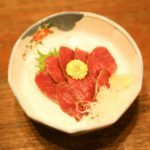 This luxurious dish includes the regular toppings of Kikurage mushroom, bean sprouts, and pork as well as two egg yolks. This shop is located conveniently near the Suido-cho Station. It is also right next to the Renshoji Park that holds the former residents of Yakumo Koizumi. 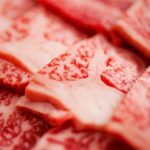 Most of the toppings seems standard to Kumamoto such as Kikurage mushrooms and pork. However, the powdered garlic that covers the toppings and noodles is something you must come here to enjoy. 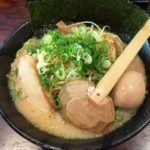 Most time Kumamoto ramen is more commonly available with more noodles than all-you-can-enjoy eggs. However, here you may enjoy as many eggs as you like. The inside of the shop is warm and snug but many women and foreigners also visit here. They close when they sell out of soup. However, they are often open late so why not enjoy a night snack here? Located in the 1st floor of a building facing Sakae Street, this shop can be recognized by its large sign in front. It has branches in both Kumamoto and Tokyo. Using garlic oil is this shop’s secret. “Taromen” is the most popular menu item here. The pork that rests on top of the noodles and the seasoned egg and the other abundant toppings are wonderful. This shop is not so far from Kumamoto Castle so it is a convenient location to enjoy a meal of ramen. This shop is the one with dragon curtains in front of the entrance. Though this shop is in Kumamoto, they offer the ramen of Kurume. You can ask for refills of this delicious soup. The most popular item on the menu is “Tonkotsu Kokumi” which is enhanced with Spicy-miso. Although this shop is slightly far from the train station, it is worth the wonderful flavor of this marvelous soup. You will recognize this shop by its large sign and white paper lantern. The most popular menu item is the “Noko Tonkotsu Ramen”. You can enjoy the regular flavor offered here or a flavor that it even richer. The 2nd most popular menu item is the tsukemen (dipping noodles). The onions in vinegar are a specialty offered here. 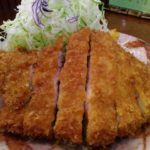 Enjoy this shop located in the birth-place of Tonkatsu soup at a shop where the Tsukemen is said to be the best! This is a shop with a retro feel. The famous menu items here are the “Bunka Ramen” and “Bunka Set”. The soup that nearly covers the noodles and toppings is special. With the “Bunka Set” you can enjoy a small ramen with rice, greens, and gyoza. There is garlic on the ramen but you also can take garlic chips from the counter to add to your ramen to your heart’s content. Come enjoy this ramen also loved by the locals! This shop is located conveniently near the Kumamoto Castle and City Hall Station. This is a rarer shop that allows you to enjoy a seafood-based broth. The noodles are medium-large straight noodles and the toppings are pork, egg, bamboo shoots and greens. The soup here is especially light due to the seafood-based broth. There is also the hidden flavor of yuzu (Japanese citrus) that much enhances the soup. You can also choose a smaller size that allows you to appreciate the rich flavors without having to eat so much. This shop is black on the outside. It is here that you can enjoy a light ramen flavored with pork-based soup. The “Tonkotsu Kuro” menu item can be enjoyed in “normal” or “rich” flavors. You may also choose from regular or large size servings. You may also ask for additional eggs. The toppings are the orthodox pork, kikurage mushroom, green onion, and seaweed. Though it is slightly removed from the station, if you are looking for a rich broth this is the place to come! This shop was opened in 1954. You will find it located in an arcade street as 15 minute bus ride and 5 minute walk from Kumamoto Station. It is marked by its red sign in front. This is a shop that boasts original Kumamoto ramen. It does well for this boast with its toppings of Kikurage mushroom, spring onion, chashu (pork), and garlic. It also includes garlic oil. You may enjoy a ramen 20 grams larger than the regular size for a reasonable 700 yen. When you come to Kumamoto please do visit! This is not a shop with the most reasonable location. However, this is where you can enjoy ramen true to Kumamoto. The popular menu items are “Ramen” and “Chashumen (Pork Ramen)”. The Chashumen has so much pork on top that you cannot see any of the other toppings. There are no sights to enjoy nearby but this is a place to visit for just the ramen! Why not forget the sights for once and seek out some of the best ramen in Kumamoto? Enjoy the Delicious Ramen of Kumamoto! What did you think of what we introduced? 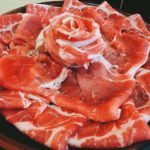 The main ramen of Kyushu may be thought to be Hakata ramen but Kumamoto is equally as special to take the time to enjoy! Today we shared with you 10 places we can highly recommend you visit. However, there are also many others we were not able to share. 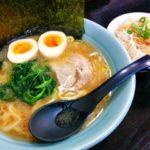 When you come to Kumamoto, be sure to come enjoy the ramen!